Home / How to Troubleshoot ELEX Address Validation & Google Address Autocomplete Plugin for WooCommerce? This article intends to provide detailed, step-by-step instructions that’ll show you how to troubleshoot ELEX Address Validation & Google Address Autocomplete Plugin for WooCommerce. Refer the product page to know more about other various features of the plugin. 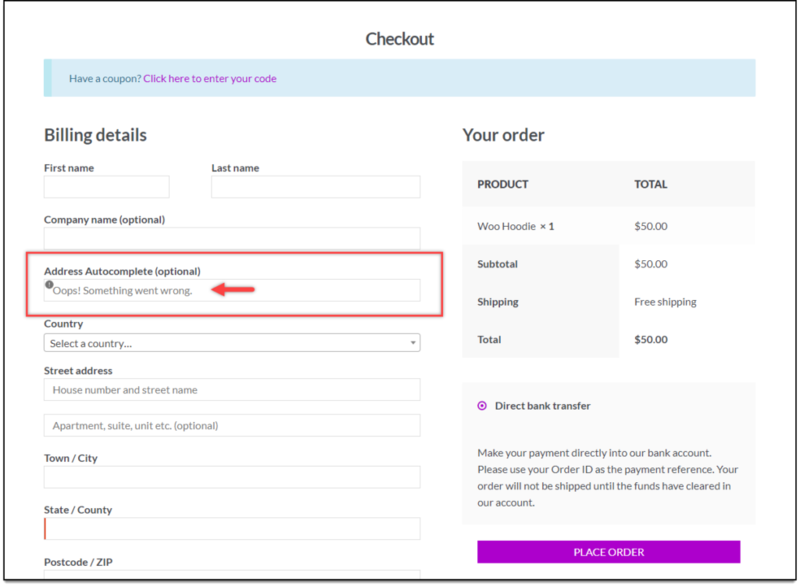 When a user adds a product to the cart and moves to the Checkout page, the Address Autocomplete text field will sometimes throw an error “Oops! Something went wrong” as shown in the screenshot below. Solution: This error occurs if the Google Maps API is invalid or is no longer active. The setting is as shown below.